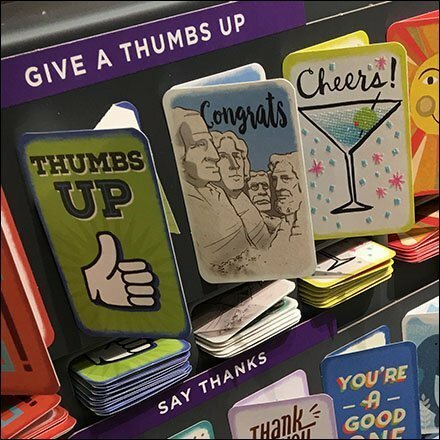 This Personally Delivered Card Merchandising offers a more civilized, more humane means of sending a message than by mail or email. And it saves on envelopes and postage stamps. Cards are displayed facing forward to show the design and allow easy access to the inside message. Backstock for purchase is stored in the tiny shelf beneath. Consider the selection in the gallery of images. This Personally Delivered Cards Merchandising theme courtesy of a Hallmark Gold Crown Store.